Maca is an incredible superfood that is beautifully grounding in our for our Root chakra. It is specifically great for women, as a hormonal support, a natural aphrodisiac and it enhances fertility. Paired with beetroots rich red antioxidants and hibiscus mood improving qualities this is a great one for us women. Measure out about a cup of warm water and soak your hibiscus flowers in the water while you prep your toppings. 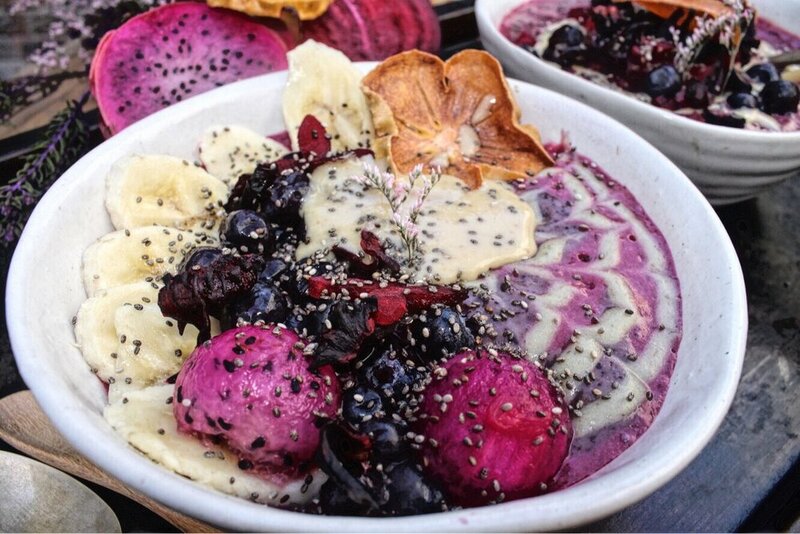 I haven't included the toppings in the ingredients list as you can really add whatever you have - I have added the chia seeds and macadamia butter but you can also add those into the smoothie. Remember that you can have fun with smoothies. Put in the bananas - you can use frozen bananas and less water if you would like a more ice cream textured bowl - add in all the superfoods ingredients and blend. To get the patterns on mine I gradually added ingredients and took some out as the colour changes. So first I did just the bananas, water and superfoods, put some aside, then I added the blueberries, put some aside and then I added the hibiscus water and beetroot juice. You can put the different colours into squeeze bottles and make swirls of colour, then run a tooth pick through the swirls. I topped mine with dried persimmons, raw beetroot, banana, blueberries, macadamia butter, my hydrated hibiscus flowers and chia seeds. Have fun and play around! !